In the Women’s event Manami Doi Japan currently World rank 6th won from Zoe Thompson WA and Marlena Berzins NSW. Manami was 8th overall in the Radial fleet. Michael Compton WA was a comfortable winner in the 4.7′s with five race wins. Wonn Kye Lee from Singapore was the runner up from Boston Cortis NSW. With a record 62 4.7′s entered in the event competition was fierce. You can see the results for the 4.7′s and Standards HERE and the Radials HERE . The event web site is HERE. Sail Sydney for the Olympic classes concluded on Thursday 14 December. Sailed from Woollahra Sailing Club the regatta saw good sailing conditions. Congratulations to Marlena Berzins for her win in the classy Radial Fleet. After a win at Sail Melbourne two weeks ago Tom Burton only managed a 5th in the Standard Rigs after one black and one U flag. 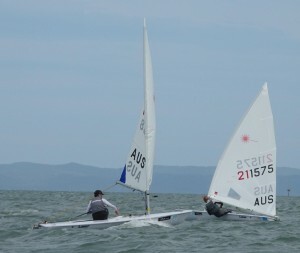 NSW & ACT State Champion Finn Alexander was 8th in the strong local and international Laser Standard fleet. In a closely fought series RSYS sailor Jack Ferguson won Sail Sydney in the 4.7′s. Jack was just two points ahead of Boston Cortis with Ryan Littlechild third. Sail Sydney results are HERE. A short video highlights clip is HERE. In 2017 there were four rule change proposals put forward before the International Laser Class Association membership for vote. All four changes were approved by more than two-thirds of voting members in addition to being approved by the ILCA World Council, the Advisory Council and World Sailing, all of which are required in order to modify class rules. Rule 22 was changed to allow the use of certain electronic digital compasses that are not GPS Enabled. ILCA will maintain a list of approved compasses on the ILCA website as an interpretation to the Class Rules. A new Rule 28 was added to allow the use of cameras while racing. Rule 3(v)vi was amended to read “A shock cord may be used as an inhaul on the clew.” This change removes the restriction on where the shock cord can be attached in the inhaul system. Rule 17(c) was changed to allow the use of one cleat and one turning point in the hiking strap support line. The cleat and turning point must be “free floating” and may not be attached to the hull or the hiking strap. The 2018 Oceania and Australian Open Laser Championships will be held between 27th December 2017 and 4th January 2018 at Royal Queensland Yacht Squadron Manly Queensland. This Championship is the only Regatta used to rank Australians applying to enter Open, Under 21 and Youth ILCA Laser World Championships in 2018. If you wish to qualify for these events from Australia you need to participate in this event. This event is also a 100 point World Sailing event presenting a great opportunity to gain world ranking points for Australia and all other Oceania Laser sailors closer to home. This will be a fabulous event run at one of the best sailing venues on the planet. The Notice of Race for the event is HERE. Standard entries closed at 16.30 on 1st December 2017. Late entries which have an additional $100 fee are now open. Entries can be place HERE. Links for boat measurement booking, event countdown and the regatta web site are HERE. If you want some practice for the big event at RQYS then the QLA Metropolitan Championship is on 9-10th December. Entry and NoR are HERE. 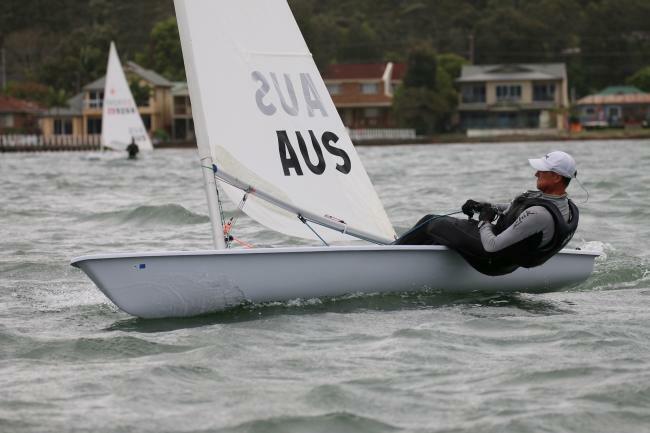 130 Laser sailors entered for the State Championships held at Double Bay SC. The event combined all age categories Junior Youth Open and Masters. You can see many of their happy faces in Clare Alexander’s photo above just before the event kicked off. The scheduled six races were completed in good sailing conditions with winds between 9 and 14 knots generally from the east. As usual there was a lot of chop but RO Adam South who is vastly experienced in this role on the Harbour managed to set our traditional trapezoidal course and stay out of the ferry and Harbour traffic lanes. This involved the inner course being close to the Point Piper shore. This gave the local residents and the Laser supporters at Duff Reserve on the point a great view of the racing and it gave the Laser sailors some practice in close quarters racing along the shore and moored yachts. The rigs were sailed as one fleet so one start each for 4.7, Radial and Standard. The Radial fleet at 60 was at the upper limit and with so many keen and competative sailors on one line there were several general recalls, black flag starts and victims thereof. It was great to see the record roll up of the 4.7′s in this event and the quality of the sailors and the racing. In the end the girls dominated taking the first three places in a close finish. Kristen Wadley from Townsville SC and RQYS was the eventual winner by just one point from Brooke Wilson RSYS/BDSC, 3 points ahead of Mina Ferguson RSYS/WSC/DBSC. The ladies also excelled in the Radial fleet with Marlena Berzins DBSC/RSYS taking the championship. Third was Fremantle SC and South of Perth YC sailor Jacinta Ainsworth while the man in the middle was Jordan Makin from Belmont 16′s. Mara Stransky from RQYS Brisbane was a strong contender with two bullets and a 7th place but reflective of the very competitive starts she scored three black flags which placed her out of contention. 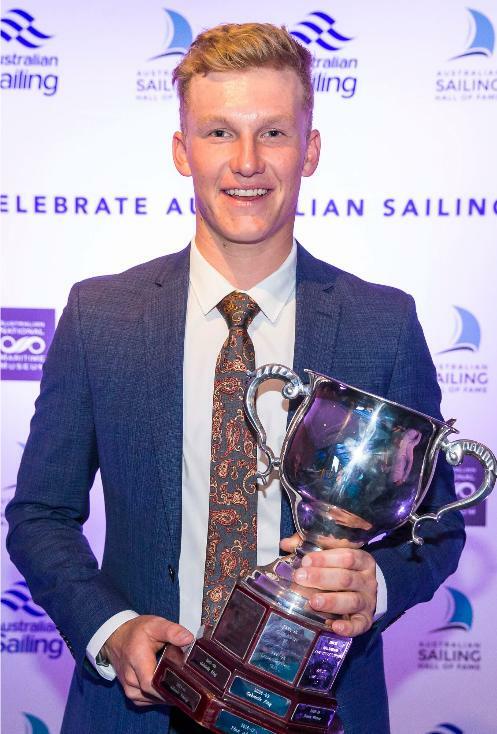 In the Standard rig local sailor and recently named Australian Sailing Youth Sailor of the Year Finn Alexander dropped a second as his worst place alongside 5 bullets to win. Second was Brett Beyer who is the current World Laser Masters Champion. Fredrik Westman from Finland was third. Hearty thanks to the Double Bay Sailing Club and all the volunteers for the great effort and for running a terrific event. Thanks also to RO Adam South who stepped in for Col Chidgey whose wife was taken ill on Friday. You can see photos of the fleet winners below and the winners of all the divisions are listed HERE. The full results of the States are linked below. The gala Laser sailing event the State Championships will be held at Double Bay Sailing Club on the weekend of the 18-19th November 2017. This year we will be running the State Open including boys, girls, youth and the State Masters in the one event. We plan to have separate starts for Masters in Radial and Standard rigs provided there are sufficient entries. The State Masters which we often run as a separate event in February would clash with the big National Masters event which is this year between 9-12th February 2018 at Mooloolaba. Hence the combined event this season. The Notice of Race for the State Championships is HERE. The Sailing Instructions are HERE. Entries can be placed at the Enter or Join tab on this site of click HERE. You can also enter up to 11.30am on Saturday at Double Bay SC. The first 150 sailors to register on Saturday will receive a commemorative polo shirt. Double Bay will be a great venue. Though the 18 footers will be sailing on the Sunday we will have lots of rigging room using Steyne Park. The club has again arranged parking at the Double Bay Primary School just across the park. Sailing on iconic (if busy) Sydney Harbour is always a great experience. Come and test your skills and performance against some of the best age category and open Laser sailors in the World at this event. We expect around 150 entries and you can see who has entered the event HERE. The Association’s Annual General Meeting will be held at Double Bay Sailing Club at 9.00am on Sunday 19th November. The agenda for the meeting and associated documents are HERE. Note that the financial reports will be available at the meeting. Come along and have your say about how the class is run in our District. Ideas and suggestions are welcome. 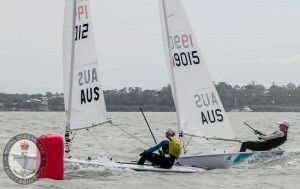 Australian Sailing have advised that it is now required that sailors who want to be considered for inclusion in the Australian Youth Sailing Team for the 2018 World Youth Sailing Championship (to be held in Corpus Christi, USA from 14 – 22 July 2018) and who are not Australian citizens to apply for, and be granted, a World Sailing Residency Waiver Certificate by 20th December 2017. If you want to be considered for this team and are not an Australian citizen then you can see the process to obtaining this waver HERE. Citizenship can, in some circumstances, be a complex business (as some federal politicians will attest). There is a useful and detailed Wiki on Australian citizenship HERE. South Lake Macquarie ASC are running their Zhik sponsored Single Handed (and Invited Dinghy) Regatta on 4-5 November. They will be racing Standard, Radial and 4.7s along with other classes. The Notice of Race with entry arrangements is HERE. The final results of the Coasts at Gosford Sailing Club 21-22 October 2017 are linked below. There are some great photos from the first day taken by Jane Humphris which you can see HERE. If you would like the full sized jpg of any photo then contact Jane at jane@sailaustralia.com.au. The Coast Championship is set to roll on the weekend of 21st and 22nd October at Gosford Sailing Club. The Notice of Race for the event is HERE SI’s are HERE and you can place entries online HERE. Notice there was an earlier posting of SI’s which included a 1A mark. This mark will now not be used the change is covered by the Notice to Competitors HERE. Gosford Sailing Club is a great social club with relatively uncrowded sailing waters and only a short drive up the freeway from Sydney. There is good local accommodation around Gosford and out to the coast at places like Terrigal and Avoca. Or from Sydney you can drive in/drive out if you like to sleep at home. Go to your favourite accommodation site or click links below for places to stay. Laser Membership is due for renewal for the new season. You can most conveniently do that online HERE or at the Coasts on Saturday 21st October. District Membership qualifies you to enter any District, National or International Laser event. Our annual fee ($40 and $20 for under 21 y.o.) is partly used to affiliate with the International Laser Association and the more members we have the more places we get for the limited entry ILCA International Laser events. The Balmain regatta is on 29th October with the 4.7 the first to start at from 12.00. Start times and handicaps to be decided on the day based on the wind forecast. Last year 2016 Gold Medalist Tom Burton won, but who will win this years Balmain Regatta? A 168-year-old Sydney harbour tradition continues on the 29th of October, offering a total prize pool of $800. $200 for each division winner, and a bonus $200 for the leader at the half way mark. The course will feature a fixed start between Cockatoo Island and Balmain Sailing Club to a mark off Snapper Island, to mark off Spectacle Island to Mark near entrance of Lane Cove River to mark off Goat Island then back to fixed line between Cockatoo Island and Balmain Sailing Club. Where to rig: Easiest rigging area is at Hunters Hill Sailing Club. How to enter. www.balmainsailingclub.com and follow directions to regatta entry. The Queensland Laser Association in conjunction with Australian Sailing is running two Coaching Clinics with Brett Beyer in the lead up to the National Masters at Mooloolaba. The two camps will run from the 3rd to the 4th of February 2018, and from 6th to the 7th of February 2018 and will be held offshore at Mooloolaba. The camp is only available to sailors attending the Australian Masters at Mooloolaba and the cost is $250 for the two day coaching clinic. Food, drinks or accommodation is not included. Australian Sailing have posted details of the 2017 Trinity Point New South Wales Youth Championships will be setting sail from South Lake Macquarie Amateur Sailing Club (SLMASC) on the October long weekend, September 30 to October 2. The Notice of Race, Sailing Instructions and online entry are all linked on the Australian Sailing Youth site HERE.